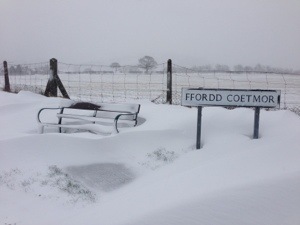 So the snow has come to North Wales! Panic ensues, as people abandon their cars all over the place. I’ve just walked back up the hill after getting a lift down the A5 and the main lesson I’ve picked up is: don’t abandon your car, it just makes it more difficult for everyone else! A lot of excitement comes with snow. Even though we’re still in Wales I’m sat here with grand thoughts of ski tours and epic descents, not to mention cold gullies and frozen belays. The big question is what happens next? 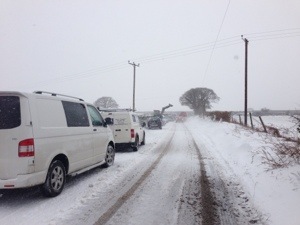 The wind is driving the snow into huge drifts and leaving other areas scoured. If it keeps up there could be some great powder gullies early tomorrow morning, or maybe we’ll just be walking around with vain hopes of a continuous line of snow down the mountain. Either way it’ll be a great day out, and there’s always sledging!